Brace yourselves foodies, our bountiful new August-September issue is hot off the press and worth savouring, from cover to cover. It's finally here, our labour of love to all things winter. If the drab wet weather, chilly climes and cold and flu season have you yearning for summertime, we suggest you get your hands on our scrumptious new issue – bound to perk you up in no time. From Sarah Tuck's decadent cover star – Steamed Caramel and Ginger Pudding with Ginger and Salted Caramel Sauce – to modern twists on warming winter brekkies like Kelly Gibney's Creamy Millet Porridge and Red Wine Roasted Rhubarb; there's so much to savour. Queen of the ladle, Dish contributor Jane Lyons, gives the hearty winter soup a well-earned upgrade, while food editor Claire Aldous serves up some serious dinner goals with an entire recipe section dedicated to roasting and braising. Try your hand at the new school of winter heroes, with Claire's easy everyday meal solutions and delight your family and friends with a decadent slice of Chocolate Almond Cake to finish (see Friday Baking). Reigning Kiwi fashion queen Karen Walker invites Dish editor Naomi Larkin in to her coveted Ponsonby kitchen, while Sarah Murray discovers what makes the old and new school of local ceramics well-worth procuring. Venture to Rotorua with Ashley Ropati and bask in the glow of David Truebridge's breath-taking nightlight's in The Redwoods, and cap off your Thirsty Thursday with one of the Dish Tasting Panel's top 12 New Zealand merlot. Dish is a bi-monthly magazine for people who love food – whether they're experienced cooks or enthusiastic beginners. Each issue is full of approachable recipes using fresh, seasonal ingredients and stories about local food producers, new products and useful guides to techniques and ingredients. Dish is based in Auckland, New Zealand and is available at retail throughout New Zealand and from selected newsagents around Australia. 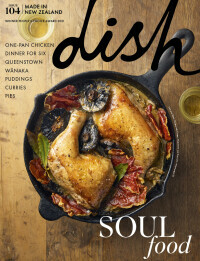 The August-September issue of Dish magazine goes on sale Monday, July 16. To secure your subscription, contact the team or learn more about Dish magazine, simply head over here.